In 1975, James Taylor was a hard-working backbencher representing the riding of Prince Edward-Lennox in the Conservative government of Premier Bill Davis. He was surprised one day in 1975 when he received an invitation to meet with the Premier at a Toronto hotel. The portfolio was challenging. It was clear the Premier expected his newest cabinet minister to dramatically rein in costs without political fallout from citizens and the many organizations it funded. But as Taylor became more steeped in his new job, he changed his views and original strategy of drastic cuts to programs to become a strong advocate for community – based services. In reviewing programs to develop a new strategy, Taylor realized people were living longer and required more care, inflation would add to costs, and traditional family supports for seniors were changing. And within the complex world of federal -provincial politics, national programs initially funded by the federal government were often downloaded to provinces and municipalities. The most - cost effective model was to deliver programs through community – based, volunteer organizations. Taylor successfully fought for a 5.5% annual increase to the ministry’s budget to provide greater support for these agencies. While minister, James Taylor funded a series of 27 pilot projects across the province aimed at delivering care for seniors through community organizations. One of the projects was in Prince Edward County, a community with a high proportion of seniors. The pilot project brought together nearly 20 local groups to share information, coordinate activities, to conduct a needs’ survey, and to be catalytic in developing affordable and sustainable programs. 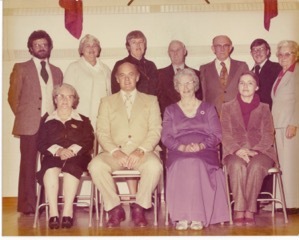 The 1977 project was the origin of The Prince Edward County Community Care for Seniors Association. Taylor would go on to become the County’s first mayor when amalgamation took place in the 1990s. The experience only deepened his admiration for the organization he had originally funded as a provincial minister. Today he is also a recipient of some of the services like foot care that the organization provides.